Had a great time. The bar is a lot of fun. The staff is great, especially Marie! Overall good vibe and pretty good location. I would totally come back! Great place, clean and lots friendly guests/staff. Definitely would reccomend. 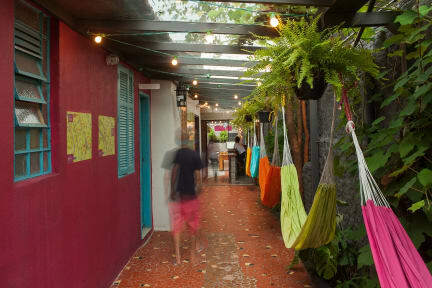 O de Casa is a super social and fun hostel in a great location! The staff speak English, really helpful and and kind. Every night there is free cachaça pong (lots of fun) and in general everybody is social in this place, the layout definitely helps with that too. Only small complaint is the lack of a proper kitchen, but the kitchen is good and reasonably priced aaaaand the staff make up for it.. shout out for Mari who is so very lovely, see you in Peru! Really great hostel. Social vibe, Cashaça pong every night, good location. Bedrooms very comfy, but a little warm. Could do with curtains across each bed. Small but functional kitchen. 10 minute walk to yellow metro line and you can be in Centro in around 20 mins. I found the staff really friendly and helpful for suggesting things to do in São Paulo. Special shout out to Mari for hyping up the bar games and making the hostel fun even on Monday nights! Definitely will return! The staff are great! So informative and friendly. Overall, we liked this hostel a lot. We particularly liked and felt safe in Villa Magdalena. However although cleaned regularly, the state of the showers and toilets were not nice due to all of the dorms sharing them. Our room was also directly opposite the showers, so we were disturbed all night and didn’t feel as safe as anyone can walk into any room. Also, the bar is open to the street so eating breakfast in a really public place felt weird. I took a risk in booking Ô de Casa. Reviews had mentioned bedbugs but I thought any decent hostel would take this seriously and fix it quickly. I was right. During my stay I saw a workman with a tank on his back and a spray gun in his hand. I stayed in a room that has been newly painted. Three days later I extended my stay - in another room that had been newly painted. I didn't interview the management but it looks like they're treating each room, one by one. I enjoyed my stay here.